Now who hates soggy, soft pickled onions???? We do! 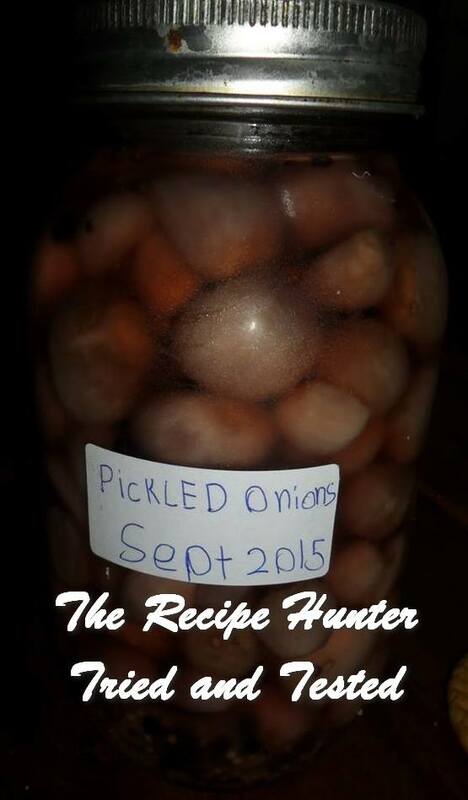 Pickled Onions are hard to source where I live and if I chance upon any they are so expensive and such a small jar.Just a no no for me. So I started pickling out of necessity rather than want but now I love it. Its quick(ish) most times and I know what goes in it (bonus) no nasties, so win, win and also along the way I have gleaned recipes for pickles from other expats. Jalapenos, sour kraut which is similar to the way Thais pickle cabbage, the list is endless and over the coming weeks, I will share them with you. 1½ pints pickling vinegar. I use white vinegar or a mix of apple cider and white vinegar. 2tbls Pickling spices or your mix…again I mix black, white peppercorns, coriander seeds, mustard seeds, bay leaf. 2 DAYS before mix 2pts water with 4 oz salt pour over onions , cover and keep in cool place. I keep in the fridge due to the heat here. Then drain onions and pat dry. Pack into sterilised jars layering pickling spices as you go then pour over vinegar making sure onions are completely covered. Store for 4-6 weeks and they ready…They are the crispest onions I have eaten, far better than shop bought and generally don’t get to 4 weeks let alone 6 weeks as they get dipped into …men! NB: I have tried heating the vinegar with spices but find cold vinegar produces the crispest onions. I also cover onions with boiling water and leave for 5 mins and find removing skin much easier.